1. Preheat the oven to 220°C, gas mark 7. Place the cod portions on a baking sheet and bake for 25-30 minutes until golden. Meanwhile, chop the onion. Heat the oil in a saucepan and fry the onion for 5 minutes. 2. Add the chillies, sugar and the drained tomatoes and heat through gently for 5 minutes. Transfer the cod portions to serving plates and spoon the tomatoes on top. 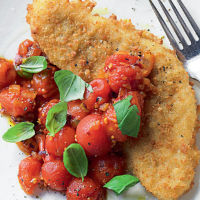 Scatter with the basil and serve with the salad.